The wonderful team over at Harper Collins has just sent me this Publishers Weekly review of My Master Recipes, my soon-to-be-released cookbook. After so much hard work it is thrilling to receive such a positive (and starred!) review, that I just had to share it with you. "In this superb tutorial, Wells (The Provence Cookbook) shares master recipes from her classes to inspire confidence in home cooks. She includes simple techniques such as blanching, steaming, simmering, and poaching that serve as the foundation of her recipes. She advocates for cooking seasonally, substituting honey for sugar whenever possible, replacing butter with olive oil when appropriate, and using organic ingredients (for which she makes a strong case). She also includes a helpful list of essential equipment. Each technique is followed by several recipes utilizing that approach with an occasional side bar on related topics such as parchment paper lids, what to do with leftovers, and trussing poultry. Recipes sometimes include wine pairings, cooking tips, or suggestions for variations. Those who already possess confidence in the kitchen can dive right into the wealth of appealing recipes, likely learning a thing or two along the way. Wells’s chapter on infusing is spectacular, including not only oils and butters but salts, cheeses, and sorbets. Asian chicken and cilantro meatballs, falafel, and mushroom brioche rolls are just a few of the immensely satisfying recipes she includes in this welcome addition to her cookbook repertoire." 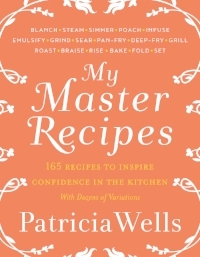 I am thrilled to announce the publication of my 15th book, My Master Recipes: 165 Recipes to Inspire Confidence in the Kitchen. For the past two years – when I have not been teaching classes and updating The Food Lover's Guide to Paris app – I have been totally immersed in creating this cookbook, in close collaboration with my excellent and able assistant, Emily Buchanan. Over the years, as an intensive week’s cooking class wound up, I would often hear students exclaim that the experience had given them much more confidence in the kitchen. I was inspired to record my most treasured recipes, ones that teach fundamental techniques and encourage useful practices in the kitchen, the little things that can make us all better cooks. In many ways, this project has influenced my cooking more than any of my other works, helping me to think systematically about the secrets to confidence and success in the kitchen, how I cook and why, which techniques I use, and why they really achieve the best results. The book covers 17 essential techniques, from blanching, searing, braising and roasting, to infusing, baking and folding. For each blueprint recipe, many variations are offered, and dozens are possible. Once the fundamentals are learned, the cook can become the master of the recipe, not the other way around, freeing us to experiment and become truly creative, offering endless pleasures in the kitchen and at the table. We worked with the wonderfully creative French team, photographer David Japy and stylist Elodie Rambaud, to create gorgeous color photographs for the book. The result is stunning and I can’t wait for all of you to see it and cook from it! My publisher, William Morrow, will be releasing My Master Recipes on March 7, 2017 but you can pre-order it now from Amazon, Indiebound and Barnes and Noble. I guarantee these madeleines – which would make fabulous holiday gifts – are like none you have ever tasted before: dense, rich, and sumptuous, made with ground almonds, beurre noisette (brown butter), and an intensely flavored honey. For this recipe, stay away from light-colored, overly sweet honeys such as acacia and go for one that is dark in color with deep, nuanced flavors that will stand up to the nutty aroma of the brown butter. EQUIPMENT: A fine-mesh sieve; a pastry brush; two 12-cavity 2 x 3-inch (5 x 7.5 cm) madeleine mold tins; a baking sheet. 2. In a small, heavy-duty saucepan, melt the butter over medium heat, stirring as it melts. Turn the heat to low and simmer the butter until the milk solids begin to brown and you have a warm, nutty aroma. Be careful, as the milk solids can burn quickly at this stage. The butter should have no specks of dark brown or black. Remove from the heat and strain through a fine-mesh sieve into a bowl to stop the cooking process. Whisk the honey into the brown butter. Set aside to cool. 3. With the pastry brush, use some of the butter to thoroughly butter the madeleine molds. Place the madeleine pan on the baking sheet. 4. In a large bowl, combine the almond meal, sugar, flour, and salt. Mix to blend. Add the egg whites and mix until thoroughly blended. Add the slightly cooled brown butter mixture and mix until well incorporated. The mixture should be like a thin, pourable cake batter. 5. Spoon the batter into the molds, filling them almost to the rim. Bake until the madeleines are golden brown and spring back when pressed with a finger, 15 to 20 minutes. If using metal molds, wash immediately with a stiff brush in hot water without detergent, so they retain their seasoning.) The madeleines may be stored in an airtight container at room temperature for several days. Happy holiday season to everyone, and wishing you many enjoyable hours in the kitchen and around the table with loved ones. To celebrate the release of The Food Lover's Guide to Paris 5th edition, our fabulous publisher Workman Publishing is offering the chance to win an amazing trip for two to France. The trip includes airfares, 3 days in Paris and a chance to dine in locations featured in the guide. Enter on the Workman website. Bonne chance!! This Wednesday I am going to be joining Ann Mah in a panel discussion at The American Library of Paris on writing about French Food. We will be talking about our respective books The French Kitchen Cookbook: Recipes and Lessons from Paris and Provence and Mastering the Art of French Eating: Lessons on Food and Love from a Year in Paris. There'll be wine, snacks and the opportunity to buy the books thanks to WH Smith. The Food Lover’s Guide to Paris was the first book I ever published back in 1984, and on the year of its 30th anniversary, I am elated to announce the release of its 5th edition – completely revisited, rewritten, and newly photographed for 2014. This has truly been a labor of love – visiting, exploring, scouring Paris in search of the city’s best gastronomic offerings. While some of the favorites have stood the test of time, much has changed in Paris over 30 years. Chefs have come and gone, others who were just starting out in 1984 have matured to excellence and have become beacons for some of the best dining in the world, and mentors for a whole new generation of talent. Paris now is a much more casual place of course, so this edition includes a whole new chapter on cafés and casual eateries. I have also included my favorite markets, bakeries, pastry shops, chocolates shops, cheese merchants, specialty food shops, shops for kitchen and tableware essentials, and of course wine shops. And as always, there is the ever-useful (and updated) French to English glossary of food terms, and a ready reference section to help you navigate the myriad of dining options in the city. And so that you can enjoy a touch of Paris in your own kitchen, I have included 40 recipes. This new edition is the perfect companion to The New Food Lover's Guide to Paris app for the iPhone and iPad. The book (and e-book!) will be released on March 11 in the United States and on April 1 in Europe, and is available for preorder on Amazon and Barnes & Noble, and from Indiebound once released. The French Kitchen Cookbook and Tour! 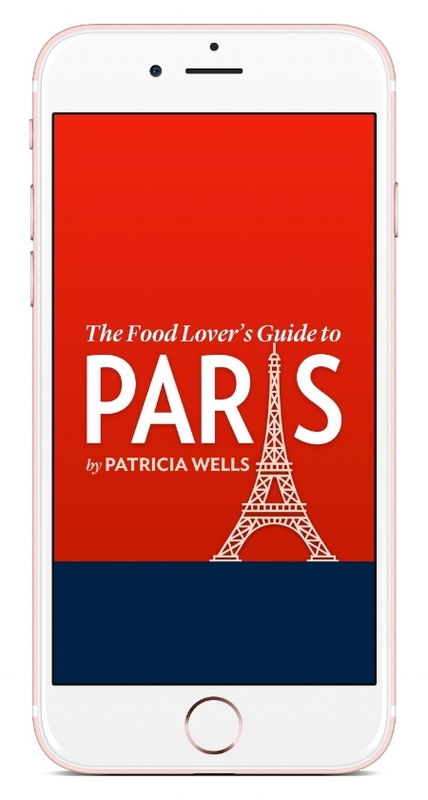 Patricia Wells's Food Lover's app is not just a guide to the best food in Paris but it's a way to dream about it when you're not there. It's brilliantly done and so easy to use. Thank you, Patricia! "Food lovers rejoice! You can now tour Paris with Patricia Wells, the city's most reliable guide to its very best spots. Her app is fast and easy to use, chock-full of terrific information and a great read. In other words, it's a delicious must have." I am delighted to announce the birth of my latest book, Simply Truffles, with extraordinary photos by Jeff Kauck! Twenty-five years in the works, it’s been a labor of love and excitement, as each new fall I await fresh truffle season, and a chance to create new recipes with that black magic mushroom. You will be happy to know that most of the recipes in the book can stand deliciously on their own, with or without truffles. In most cases, the truffle is a last-minute embellishment. Simply Truffles can be ordered through the links below, or through your local bookstore. I am sharing a favorite recipe from the book, one for Belgian Endive, Pine Nut, Chive, and Truffle Salad. This refreshing winter salad offers crunch, aroma, a fine blending of flavors, and a pleasing contrast of colors. Serve it as a first course, with plenty of crusty bread. Equipment: A small jar with a lid; a mandoline or very sharp knife. With a vegetable peeler, peel the truffle. Mince the truffle peelings, place in the small jar, and tighten the lid. Reserve the peelings for another use. With the mandoline or very sharp knife, cut the truffle into thick slices, then into matchsticks. Toast the pine nuts: Place the nuts in a small, dry skillet over medium heat. Shake the pan regularly until the nuts are fragrant and evenly toasted, about 2 minutes. Watch carefully! They can burn quickly. Transfer the nuts to a bowl. Add the truffles and chives. Toss with just enough pine nut oil to coat the ingredients lightly and evenly. Season lightly with the salt. Slice each endive head lengthwise in half. Place each half, cut side down, on the cutting board and cut on the diagonal into thick matchsticks. Place the endive in a large salad bowl. Add just enough pine nut oil to coat the vegetable lightly and evenly. Season lightly with the salt. Arrange the endive on 4 individual salad plates. Top with the pine nut, truffle, and chive mixture. 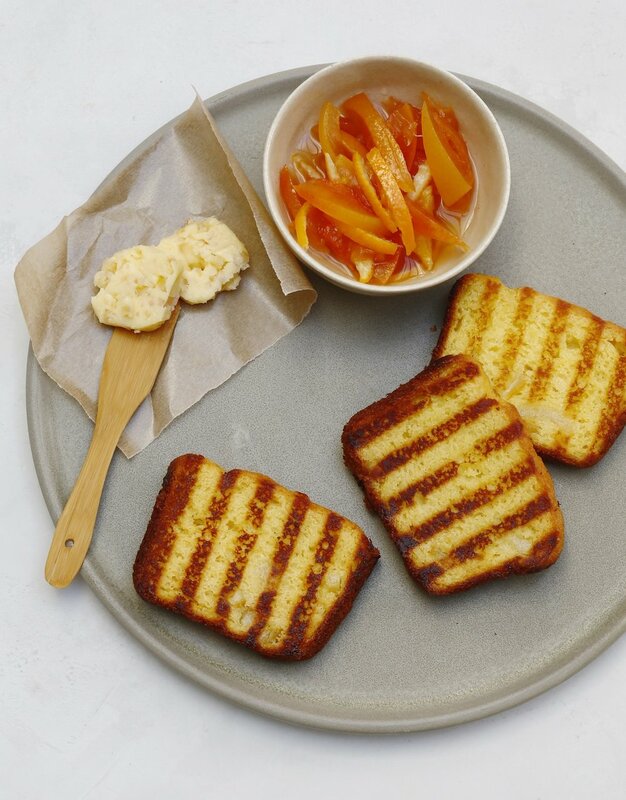 Serve with the toast. Variations: For a colorful, heartier winter salad, add about 8 ounces (250 g) each of tiny haricots verts green beans, blanched and refreshed; seared pancetta matchsticks; seared fresh mushrooms. It was only a few seasons ago, after I went rather wild about creating all manner of seasoned salts, that I leapt with enthusiasm into the production of truffle salt. It’s magic and now one item that I am never without. Just the tiniest amount of minced truffle peelings paired with fleur de sel, or even fine sea salt, can transform a dish – an effective way to extract the most out of the costly truffle. Even in the heat of summer it is there in the freezer to perk up a salad, an egg dish, you name it. Don’t embrace truffles without embracing truffle salt. I just arrived on the ferry from Seattle, and am bathing in the sunshine and pristine environment of Orcas Island, a land of rugged peaks and craggy shores cradling oyster beds, organic lamb, pork, poultry, and produce. We have already enjoyed the local mussels and clams and look forward to more tonight, at a dinner for Salad As A Meal. But there's more! My good friend and local food expert Jeffrey Bergman (pictured right) will join with host John Trumbull (pictured left) at the warming Rose's Bakery and Cafe from May 15 to 18 for a fabulous hand's on Culinary Workshop. Jeffrey will take a select 10 students on a local tour, as guests gather around the farm table for feasts, caravan to Judd Cove for an oyster class and picnic-style feast on the beach. There will be hand's on classes with local produce, tours of gardens and farms, and of course a wine tasting. Alas, I will be back in France then, but you can join in and profit from Jeffrey's vast expertise and enthusiasm for food, wine, and the Seattle area. To sign up, contact Jeffrey at quincetree@comcast.net or phone him at 206 721 2592. Domaine Ostertag Riesling 2009 "Vignoble d'E"
Can't wait until we all get together again, and often! Salad as a Meal has arrived! I am delighted to announce the birth of my latest book, Salad As A Meal! To celebrate, I am sharing a favorite recipe from the book, a lightened and updated version of the popular Alsatian Onion and Bacon Tart, known as Flammekuchen. While I prepare this with homemade bread or pizza dough, use your favorite recipe or purchased pizza dough. This is a memory lane recipe for me: when researching The Food Lover’s Guide to France in the early 1980’s, we found this fragrant onion and bacon tart on the menu everywhere in Alsace, and since then it has become a favorite bread tart. 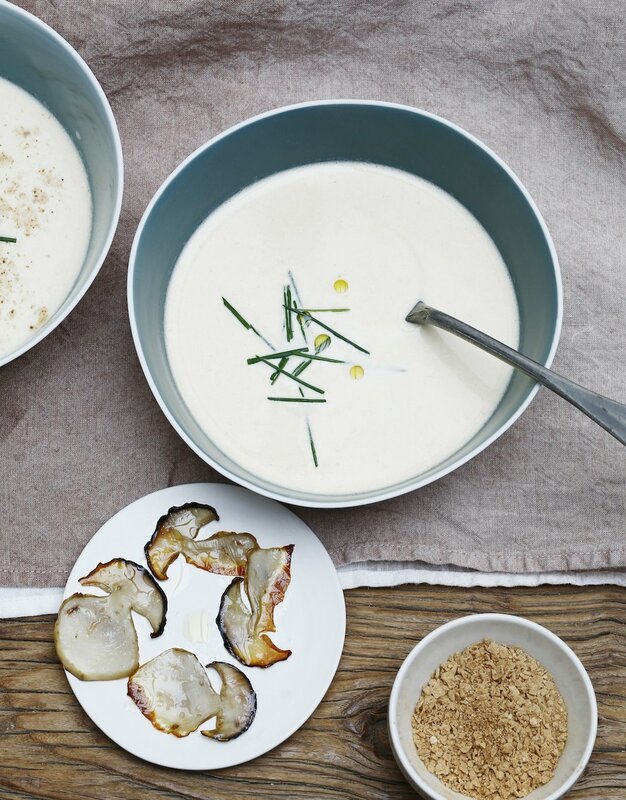 This is a lightened version, prepared with fromage blanc or with yogurt, rather than a richer heavy cream or crème fraîche. Likewise, the onions are steamed rather than cooked in fat, making for an ethereally light tart. 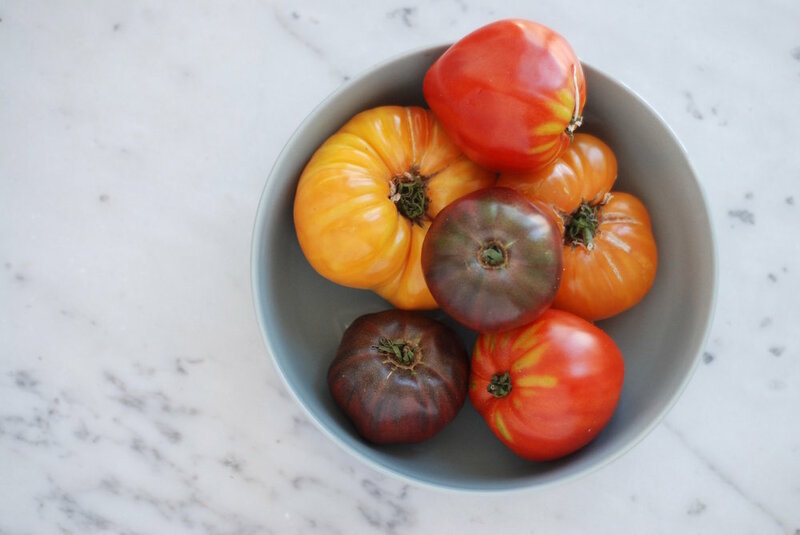 Serve it with a simple green salad as a meal, with a glass of chilled Riesling. Equipment: A baking stone; a steamer; a wooden pizza peel; a metal pizza peel or large metal spatula. Place the baking stone on the bottom rack of the oven. Preheat the oven to 500 ° F.
Separate the onions into rings. The onions should yield about 4 cups loosely packed onions. Bring 1 quart of water to a simmer in the bottom of a steamer. Place the onions on the steaming rack. Place the rack over simmering water, cover, and steam until the onions are al dente 5 to 6 minutes. Remove the basket from the steamer to drain the onions. (This can be done 2 to 3 hours before serving. On a generously floured work surface, roll the dough into a 12- inch round. Sprinkle the wooden pizza peel with polenta and place the round of dough on the peel. Working quickly to keep the dough from sticking, assemble the tart: Spread the yogurt mixture evenly over the dough. Sprinkle with the remaining pancetta. Season liberally with pepper. Wine suggestion: A young, fresh dry Alsatian Riesling is in order here: Try one from the reputable firms of Ostertag or Zind-Humbrecht, crisp, dry, smoky wines with a saline touch of chalky minerality, an even match for the creamy onion and pancetta mixture offset with a hit of black pepper. Note: If you don’t have a baking stone and a wooden peel, simply sprinkle the polenta on a baking sheet, place the round of dough on top, assemble the tart, and bake on the baking sheet. Salad as a Meal Challenge! I am excited to announce the beginning of the Salad As A Meal Challenge! 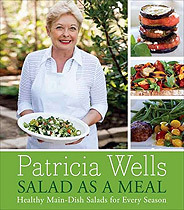 My new book Salad As A Meal will be published April 5, and my wonderful publisher William Morrow has organized a fabulous month long challenge, offering free copies of the cookbook for those who cook at least three Salad As A Meal recipes a week for four weeks and blog about their experience. I’ll be following your comments, and look forward to every last bite! Click here to get the all the details, including how to enter, program guidelines, and blogger benefits. We’ve had a tremendous amount of excitement about Salad As A Meal. Enthusiasm on blogs and in publications has been fantastic! Cooks attacking the Four Weeks of Salad As A Meal Challenge have raved about the Crab Salad with Lime and Avocado (p 124) The BLT Tartine (p 83), My Cobb Salad (p 57), the Zucchini Carpaccio with Avocado, Pistachios, and Pistachio Oil (p 114), and of course the recipe that seems to be everyone’s favorite in this cookbook, the Poached Turkey Breast Salad with Lemon, Capers, Cornichons, and Mint (p 207). (During my current series of cooking classes in Paris, the moist, amazing turkey breast salad was named Best Taste of the Week three weeks in a row!) We’ve been featured in Food & Wine Magazine, a flurry of blogs, and many more mentions are on their way.